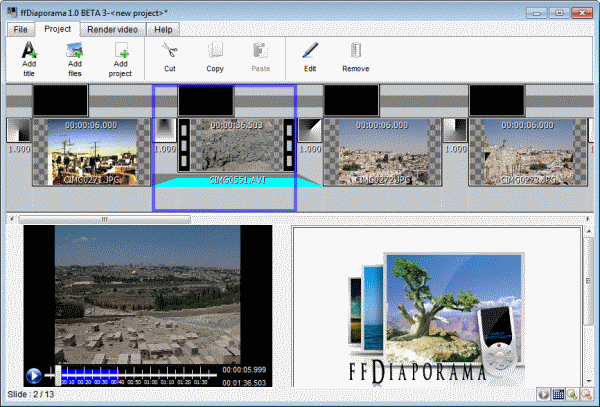 You can use a program like ffDiaporama to create a single movie file from multiple photos, video files and music. This can be interesting for users who do not want to send individual photos or videos to friends, family or colleagues. Another would be to upload the self-created movie to a video hosting site like YouTube which do not support photos. FfDiaporama is available for Windows and Linux systems. This makes it more flexible than movie creators such as Microsoft’s Movie Maker. The interface of the program needs a bit of getting used to time. Each movie is basically created as a project in the application. Videos and photos are added via the Project > Add files button. It is possible to select multiple files at once from a connected storage device. Supported are all major video and photo formats. I was for instance able to upload jpg images and avi videos that I had created during my Jerusalem trip last year. Each file is then shown in a time frame in the application window. It is possible to re-arrange photos and videos by drag and drop. A preview area is displayed in the same window. Here it is possible to preview the current movie, along with all photos, videos and effects that have been added to it. Additional buttons can be used to copy or remove slides from the movie. 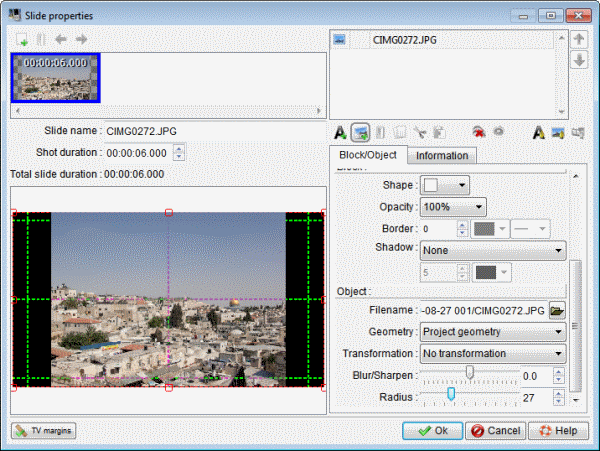 The Edit button links to five options: Edit background, edit slide, edit music, edit object transition and edit background transition. They all open up in a new window. A double-click opens the edit window of the selected slide. Many different options become available here: From changing the display duration or name to adding text or media to transformations and other effects. Everything is shown directly in a preview area in the window. Projects can be saved at any time to to continue working on the movie at a later point in time. The Render Video tab in the end is used to create the movie. Available are profiles to create a movie for smartphones and players, multimedia systems or the web which means Flash, HTML5 or video sharing sites like YouTube or Dailymotion. Transitions between sequence with definition of the transition type, sequence by sequence. Addition of a background sound (wav, mp3 or ogg) with customizable effects of volume, fade in/out and passage in pause, sequence by sequence. Video format from VGA (640×4800) to Full HD (1920×1080) by way of the DVD and HD 720 formats. FfDiaporama has a lot to offer functionality wise. It is especially useful for users who cannot install a simpler program such as Windows Live Movie Maker or users who need more functionality than that programs offer. If there is something to criticize it is the overladen interface that is not as intuitive as it could be. Windows and Linux users can download the latest official version of the movie creator from the official program website. This entry was posted in Uncategorized and tagged photo, video by me. Bookmark the permalink.